There is something so miraculous about babies and their journey into our world. Little beings, born out of love, join us on this earth and are immediately dependent on us. Yet we are so in love with them the moment they enter our lives. Their parents have been through so much while they wait to welcome them into their family. The mothers truly glow while their little one grows inside of them. Ellen was no exception. 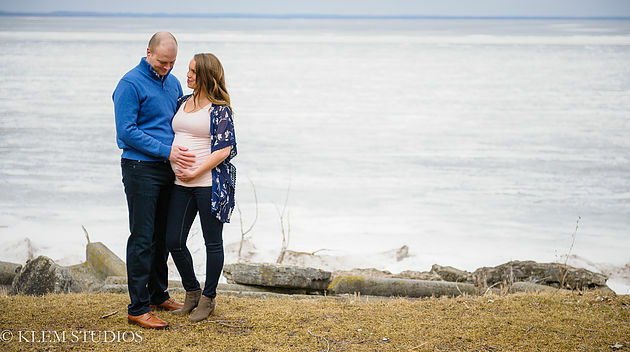 Ellen and Eric are somewhat-patiently waiting to meet their little girl, Baby A, and wanted to document their journey by starting with an adorable maternity session at UWGB. Ellen was absolutely gorgeous with (and without!) her baby bump. I loved the spring fashion she brought with her, showing off her baby belly in a pink flowy dress ensemble and blue floral shawl outfit. Eric, of course, stood handsomely by her side as they made each other laugh and strolled among the trees in the UWGB Arboretum. It is quite clear to me that these two are going to make fantastic parents. Both sets of grandparents are eagerly awaiting the arrival of their sweet girl as well, already doting on her with tiny outfits and pink nurseries. Congratulations on your growing family, Eric and Ellen. I can't wait to meet your little girl! Green Bay Maternity Photography: Sammie and Kyle are Expecting!